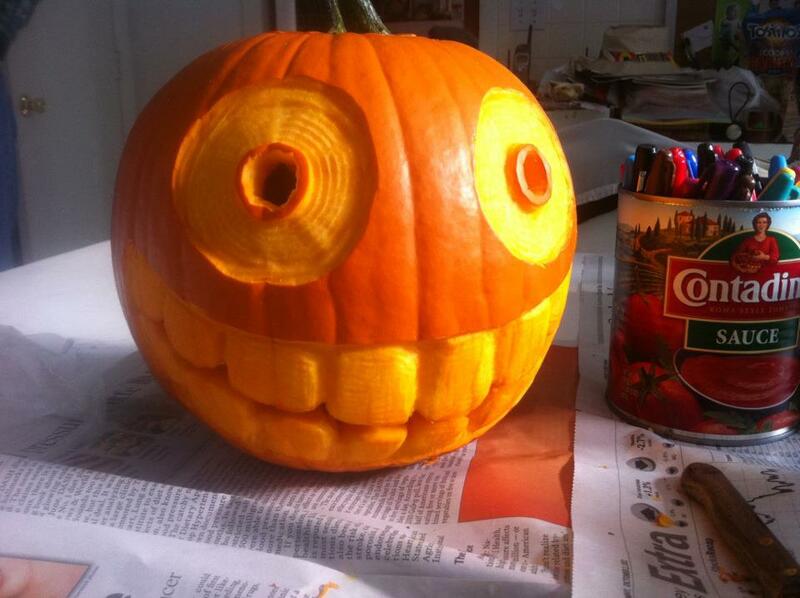 Stop-motion pumpkin carving is awesome. 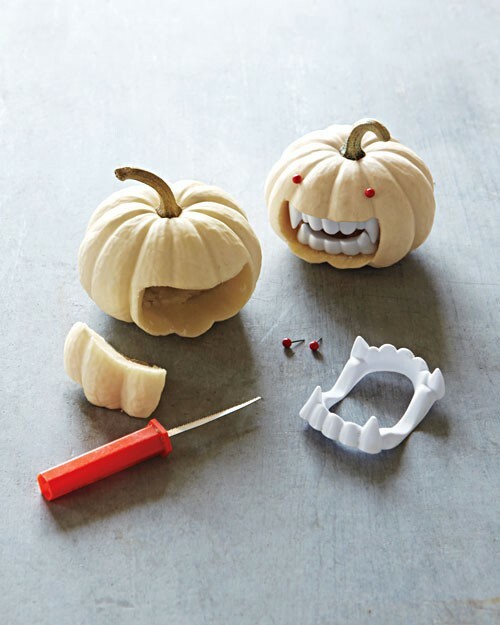 Many gourds sacrificed their lives [via]. Hunting without killing is ballsy as all get out. Psych out the predators and steal their stuff before they figure out what’s going on and they kill you [via]. The Growlers is an excellent name for an excellent semi-retro band. I love ’em. Bite The Buffalo is an excellent name for an excellent semi-retro band. I love ’em. Have a great weekend, folks, and we’ll do something different tomorrow. Or not. 20 minutes start to finish, no template. I was going for a Samoan Luche Libre kinda vibe. In the sun it looks like The Donald, but that wasn’t the intent. We had a total of three trick-or-treaters. One was a little yappy dog. The other two were adult women begging for candy, and one of them thought jogging pants and a sweatshirt and carrying a little yappy dog counts as a costume. The other one was wearing crow feathers. Her outfit was awesome, and she’s completely nuts. Then The Missus got HER knives out. These were good, orange bell peppers stuffed with rice, corn and black bean farts. I love Halloween. 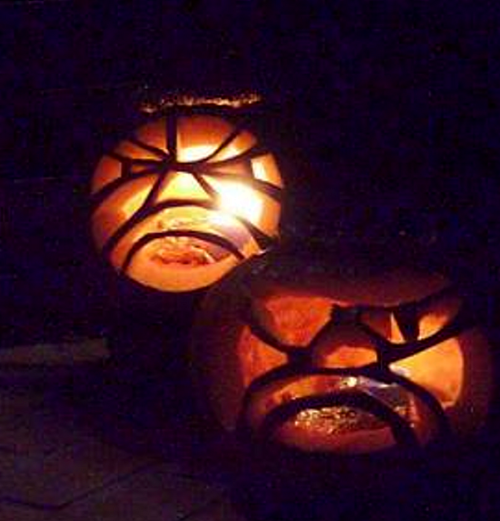 Nice pumpkin carving tips. 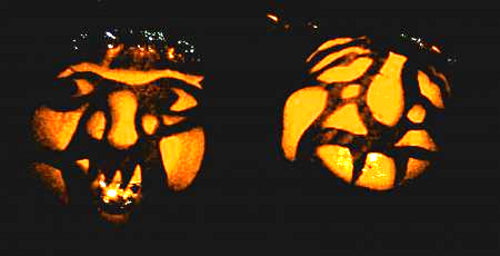 I use an orange Sharpie to mark the design, and carve with a serrated fish boning knife. Pre-designed push-pin patterns are for pussies, and using a Dremel is cheating big time. BTW, this is NOT how to do it. 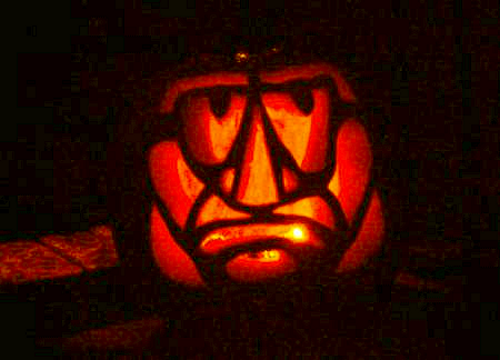 That’s from Frank Zappa’s MTV Halloween Show 1981 at the Palladium NY. “Doreen” is classic, with doo-wop lyrics and chord patterns done in 4/4 time. “Goblin Girl” is typical FZ snark and innuendo. The best Halloween Band (IMO) is Oingo Boingo, and they got their start as “The Mystic Knights of the Oingo Boingo on The Gong Show. Pure awesome. Have a great weekend, folks. We’ll be back here tomorrow for more stupid. 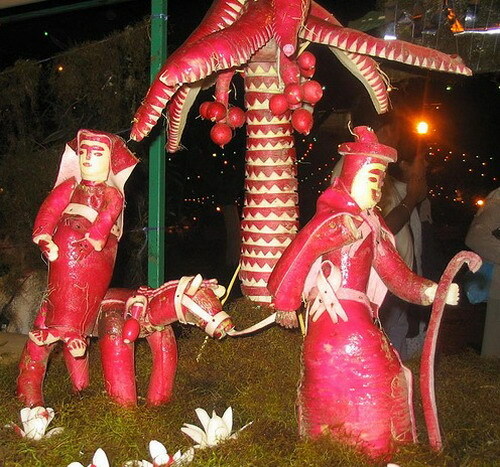 Noche de Rabanos (Night of the Radishes) takes place every year, on the 23rd of December, in Oaxaca,Spain and is one of the most impressive vegetable festivals around the world. The radish was brought to the Americas in the 16th century, and back then the vendors used to carve them and use them on their market stalls to attract customers. Although the origins of the festival cannot be traced to an exact period, it is considered that it all began in the year 1897, when the mayor of Oaxaca organized the first radish-art exposition. Everever since that first celebration, every year, this humble vegetable is meticulously carved into animals, warriors, kings, dancers and pretty much any shape you can imagine. The artists sometimes make use of other vegetables, like onion or lettuce to complete their work. There’s also a prize for the most beautiful piece displayed. The carver’s work begins about three days in advance and on the 23rd of December, the day of the festival, the results of all their hard work is presented to the public. On that same day, especially in the morning, children have the chance to learn this incredible art of radish-carving, or at least some of its secrets. The celebrations don’t end that day. They continue on Christmas Eve and Christmas Day with other joyful “fiestas”, parades of floats, fireworks music and dancing. Almost missed it, but Happy Birthday, Axe Cop! 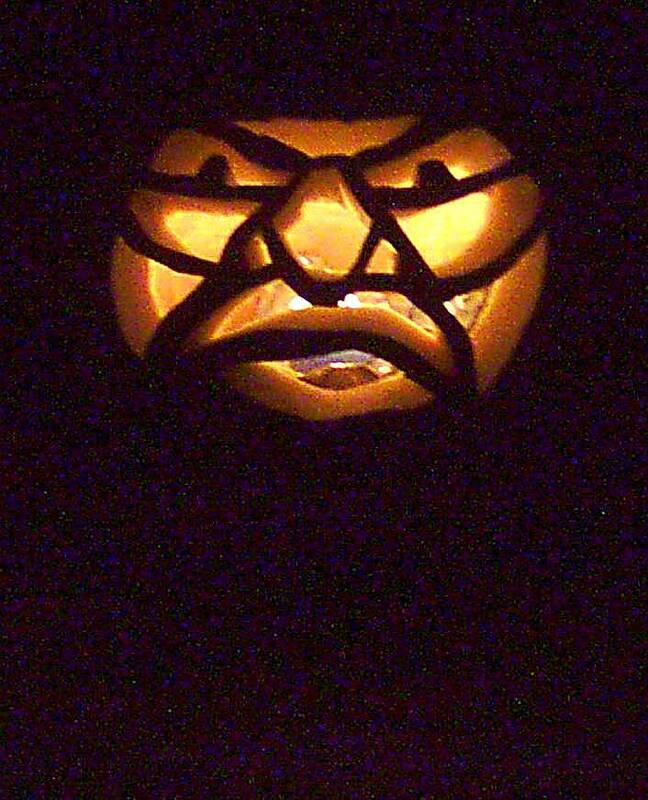 I’m proud to say that my grumpkins make big dogs bark and little kids cry. 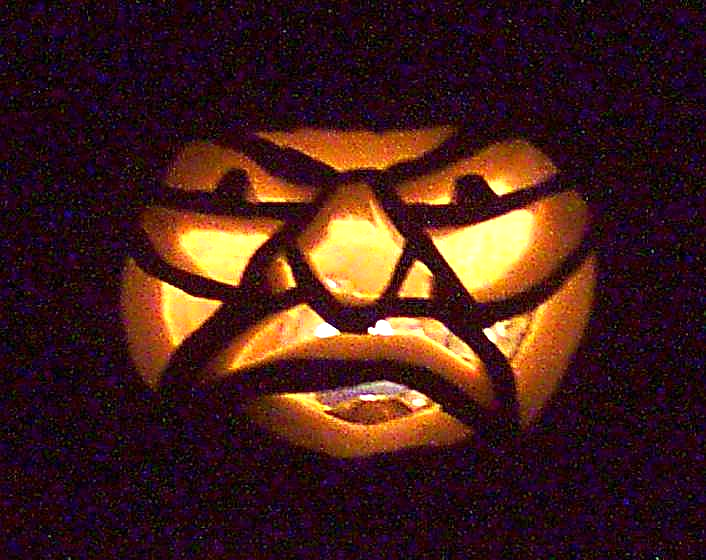 Previous year’s grumpkins can be found here and here. 2,190,329 Cheap Thrills since YOU showed up!